The Cape Cod is one of America 's oldest and most enduring styles for family homes. English colonists who came to the United States in the 1700s began building tight little homes that could withstand fierce weather. Original Cape Cod homes were one-story, shingle-sided cottages with no dormers. Two basic rooms were heated by a central chimney. Later, a kitchen or bedrooms were added to the side or back of the house. In many ways, these early Cape Cods were an early version of the starter home. The Cape Cod was popular until 1850, when its use declined as European influences dominated home building. The style had a sudden resurgence of popularity from 1930 to 1950. The Depression and the renewed interest in Colonial period architecture combined to create a desire for small, affordable, yet old-fashioned homes that provided comfort and security. After World War II, Cape Cods were built in planned suburban developments throughout the United States. Mail order housing plans available from Sears and other companies also boosted this style's popularity. The acknowledged master of the 20 th century Cape Cod house was Royal Barry Wills, whose house plans set the standard for this style. Fancier Cape Cods might include a bay or picture window, sidelights, and a transom window. 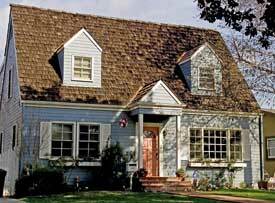 The Cape Cod style was not particularly popular with Fullerton residents, but there are scattered examples around the city. A good representative example of the style, the residence at 541 W. Whiting Avenue was built in 1982. Crochet, Treena. Colonial Style: Creating Classic Interiors in Your Cape, Colonial, or Saltbox Home. Newtown, CT: Taunton Press, 2005. Gitlin, Jane. Capes: Design Ideas for Renovating, Remodeling and Building New.Newtown, CT: Taunton press, 2003. Massey, James C., and Shirley Maxwell. "The Cape Cod Revival: Reinventing Vernacular Cottages for Modern Suburbs." Old House Journal March/April 2003: 88-95. Schuler, Stanley. The Cape Cod House: American's Most Popular Home. Exton, PA: Schiffer, 1982. Schuler, Stanley. Saltbox and Cape Cod Houses. West Chester, PA: Schiffer, 1988. Wills, Royal Barry. Houses for Good Living.New York: Architectural Book Publishing Company, 1940.